When you receive files from different AS2 trading partners, chances are, you would want to store those files under distinct folders representative of each trading partner. So, for example, if you have a trading partner named TP1 and another trading partner named TP2, you would want files coming in from TP1 to be stored in a folder associated with TP1 and files coming in from TP2 stored in a folder associated with TP2. Next, you need to create one user for each trading partner. For example, you might want to create a user named TP1user for TP1 and a user named TP2user for TP2. 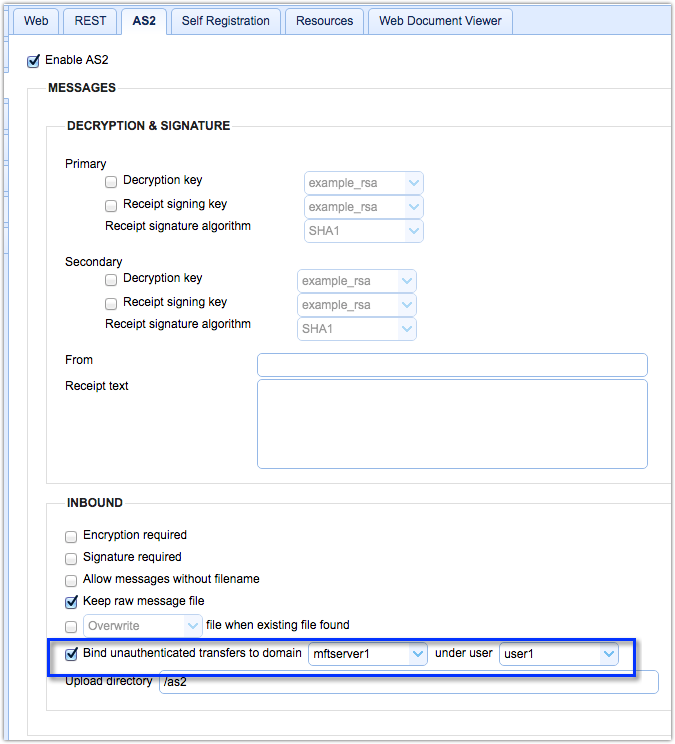 So, when your trading partners set up connections to your AS2 service, they need to authenticate using the user accounts assigned to them. That is, TP1 should authenticate using TP1 user and TP2 should authenticate using TP2user. That way, when TP1 uploads files to your MFT Server, those files will be stored under the TP1user account and when TP2 uploads files, those files will be stored under the TP2user account.